During the month of August 2018, Detectives with The Montgomery County Sheriff’s Office, along with Detectives of The Auto Theft Task Force began a joint investigation due to a high number of trailers being stolen in the Montgomery County area. During the course of the investigation, Detectives identified James Cary as a possible suspect. Detectives began surveillance of Cary at which time they observed him stealing a Wells Cargo box trailer from a residence in Montgomery. Detectives followed Cary until it reached a residence located at 29000 Timber Trail St, Spring, Texas. At that time, Detectives and Deputies arrested Cary. Detectives made contact with the trailers owner who had just found it missing. 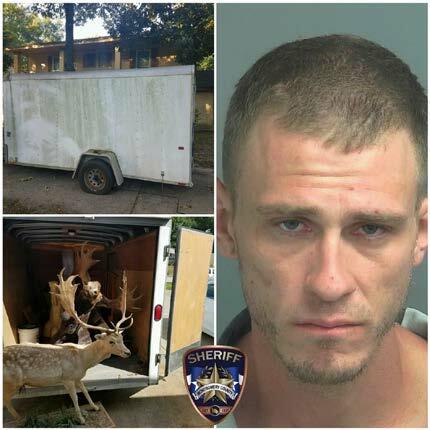 The trailer contained taxidermy mounts of full bodied animals and shoulder mounts valued over $10,000.00. The investigation continues and further charges are anticipated.